Think about it – most of the time, pain relievers and supplements intended for people are found in medicine cabinets or personal bags and purses. It’s easy enough to hang bags and purses on a high hook instead of throwing them on a chair when you get home at night – that eliminates the opportunity for pets to access them there. And more often than not, you take or give medications in one of two spots - the kitchen or the bathroom. Conveniently, both of these rooms typically have a sink. Dispensing all medications and supplements over a sink will decrease the possibility of your pet gobbling up a dropped pill before you can find and retrieve it. If you don’t have a sink, the bathtub, toilet, trashcan, or any bowl are all great alternatives. Just because medications are popular and (seemingly) safe in people, please don’t make the mistake of thinking that they can safely be given to your pets. Just a little awareness and simple changes to routine will prevent the majority of pets from accessing and eating human medication. Unfortunately, it’s quite common to hear about members of the human medical profession self-prescribing human medications to their pets without consulting with their veterinarian. It’s also common for pet owners to consult “Dr. Google” for treatments to certain ailments and with good intentions, offer their pets the medication they find listed online. It’s NEVER okay to treat your pets with human medications without first consulting your trusted veterinarian – regardless of whether or not you are an MD, DO, RN, or even PhD. Trust me, it’s just not worth it. This is the active ingredient in products such as Tylenol®, Panadol®, Excedrin®, and most generic ‘non-aspirin’ pain relievers. Acetaminophen is also an active ingredient in many of the common over-the-counter combination cold, flu, and allergy medications. Acetaminophen is highly toxic to cats! 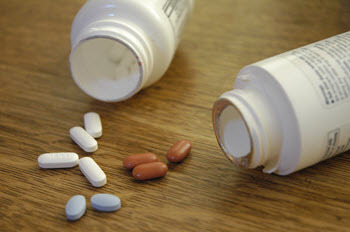 Even in low quantity ingestions, acetaminophen can cause severe damage to a cat’s red blood cell structure, preventing them from performing their vital function of transporting oxygen to the tissues throughout the body.Acetaminophen can also cause direct and significant damage to a cat’s liver and kidneys. All of this will translate into a prolonged and expensive hospital stay for your cat, and without appropriate treatment, their prognosis for survival will be very poor. Acetaminophen is toxic to dogs too, though usually higher doses are necessary before signs of toxicity are seen. In fact, under certain circumstances, acetaminophen is used to manage pain in dogs. But it can only be safely done in consultation with your veterinarian and typically only in very certain or special circumstances. In most cases there are safer and more effective options. Though you may not recognize the term NSAID, you will likely recognize the trade names of several of the drugs that belong to this very common drug class. They include Advil® and Motrin®, both of which contain ibuprofen, and Aleve®, which contains the pain reliever naproxen. Aspirin is a member of this drug class as well, as are many of the common prescription pain relievers such as Celebrex®, Vioxx®, and Bextra®. Ibuprofen, aspirin, and naproxen are also commonly found in many of the best-selling combination cold, flu, and allergy medications. In fact, my suspicion is that if you checked your medicine cabinet right now, you’d find at least one product that contains a non-steroidal anti-inflammatory drug. kidney failure in inquisitive (or bored) pets unfortunate enough to eat them. As is the case with most toxicity, treatment that is initiated sooner is more likely to be successful and less expensive. Hang purses, diaper bags, backpacks and any other bags on coat hooks or coat racks and high up off the floor. Do not leave them sitting directly on the floor and do not leave them laying around on couches, chairs, countertops, or even from doorknobs. Do not leave any medications out on kitchen or bathroom counters. Many cats like to jump on and explore counter tops and many larger dogs will ‘counter surf’ to find potentially tasty morsels. Even if such medications are in their original packaging, they are not safe… ‘child proof’ does not equate to ‘pet proof’! When dispensing medications of any type, do so over the sink or trash can. This way, when more spill out than you are intending, which they often will, the excess will fall safely into the confinement of the sink or trash, rather than onto the floor or under the couch where your pet will likely gobble them up. When people are staying at your house, be careful of their luggage and toiletry bags. Request they keep the door to their bedroom and bathroom closed to prevent your pet’s access. And be sure that they keep their bags off the floor and their medications off the counters. Never self-prescribe pain medication to your pets! If your pet is in pain, either acutely or with chronic pain, they need to be seen by a veterinarian. There are veterinary emergency facilities that are open 24 hours when your regular veterinarian’s office is closed. The first step in the event of any poisoning is to safely remove your pet from the area to prevent further exposure. If your pet is already showing signs of toxicity – which may include vomiting, weakness, salivating, collapse, seizing, or a number of other potential abnormalities – they should be brought immediately to a veterinarian for evaluation and treatment. In some cases, waiting even just a couple of hours to ‘see how the pet does’ can make the difference between survival and death. If your pet is not showing outward signs, you should immediately call your veterinarian or one of the veterinary-specific poison control hotlines listed below for information and advice. I suggest posting these numbers near your home phone and programming them into your cell phone. While there is often a charge associated with contacting these veterinary-specific poison control hotlines, it’s typically far less than you would have to spend on the unplanned visit to the veterinarian. And, if you do wind up bringing your pet to the veterinarian following the call to poison control, you’ll likely be doing so with both you and your pet in a better situation.